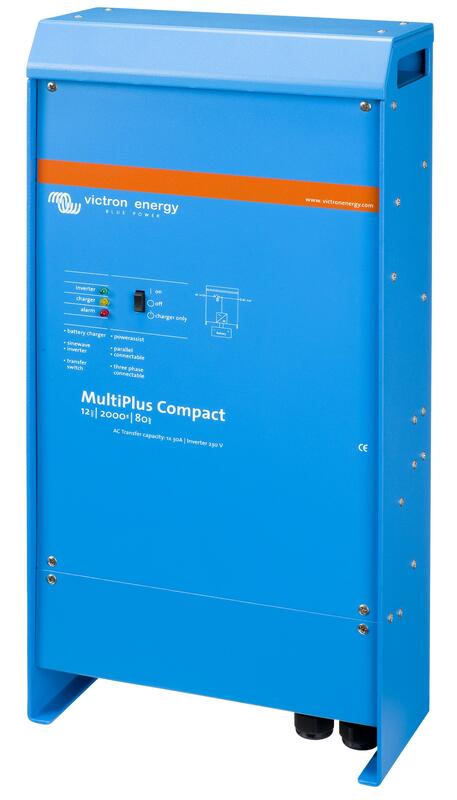 At 1600VA, this Victron MultiPlus C inverter-charger is particularly popular for use in motorhomes and caravans, because it is able to power most mid-sized kettles and hair-dryers, which regularly draw 1000-1500W. All MultiPlus inverter-charges combine a powerful true sine-wave inverter and advanced adaptive charger with a a high-speed AC transfer switch (12-millisecond changeover time). Systems grow and change over time, so it is possible to connect up to 6 MultiPlus units together in parallel to achieve a higher output, for example six 1600W units can be linked to produce a 9.6kW system with six times the charging capacity. In addition, the MultiPlus can be used in ‘three-phase’ systems, where three units are used (one for each phase). This means that up to six sets of three inverter-chargers (18 in total) can be connected in parallel, producing 18 times the power output in 3-phases!